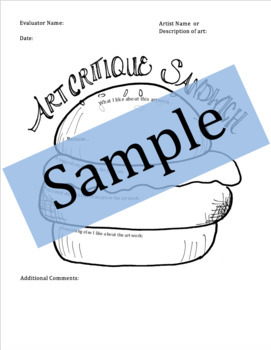 My students love using my art critique sandwich worksheet (it's actually a hamburger)!. I created my own because I didn't like any of the ones I found online. The purpose of this worksheet is to allow for a positive, yet constructive critique experience where students evaluate each other's art. It can be done anonymously or not. The critique can be done in detail or as a brief activity. I have included a zip file with a pdf of a large (full page) and a small (half page) version of this worksheet.